Plymouth Argyle Ladies returned home from Hampshire with the ‘Dockyard Derby’ bragging rights following an impressive 3-0 win over Portsmouth. The victory moves them up into third place in the Women’s National Southern Division. England Under-20 international Jessica Jones (pictured) enjoyed a good afternoon, scoring two of Argyle’s three goals. The Pilgrims also managed to keep their first clean sheet of the season. They went in to the match with their normal 4-2-3-1 formation. Amber Pollock regained her place in the team after returning from holiday, while Steph Beck took a spot on the substitutes’ bench after missing last week’s match through illness. Portsmouth flew out of the blocks and for the opening ten minutes pressured the Argyle defence, who at times looked at sixes and sevens. The hosts played three at the back which unsettled the visitors’ defence. But eventually the Greens settled and started to press high up the pitch. It was a plan that worked as Portsmouth goalkeeper Robyn Levett was forced into playing a weak clearance to Danielle Rowe, who was dispossessed by Jones who promptly let fly into the net. The goal settled Argyle further and they really started to move the ball around which caused the Portsmouth players to make rash challenges. It was from one of those challenges that led to Argyle doubling their lead. A 38th minute Zoe Cunningham free-kick following a foul on Helen Bleazard ended with Kayley Lane ghosting in to avoid the offside trap to score with a diving header. The second half carried on the same as the first with Helen Bleazard having a shot well saved and Cunningham firing over after being put through by Becky Dandridge. Argyle clinched the three points when, five minutes from time, a triangle move between Cunningham, Darcey Hepworth and Dandridge ended with Cunningham sending over a pin-point cross which was met with a diving header from Jones. It was Argyle’s fourth win on the road this season and it was an emotional game for captain Kate Middleton, who had lost her grandfather the day before. She dedicated the victory and Argyle’s first clean sheet of the season to him. 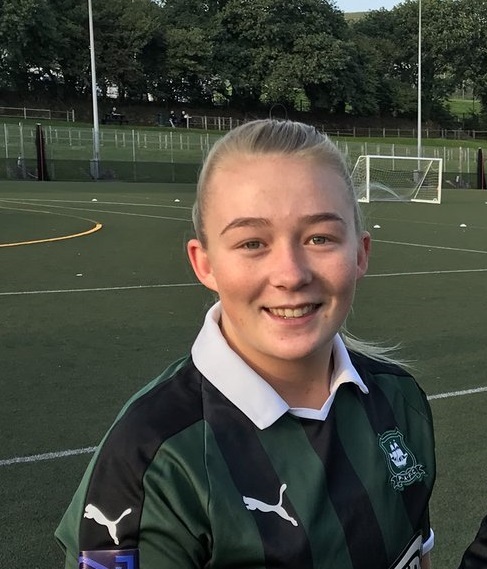 In the South West League Western Division, Argyle’s development team dug deep to gain a 1-1 draw away at Alphington, who had gone into the match with a 100 per cent record. The young Greens were thankful to goalkeeper Amy Darnley for earning them a point with a stunning second half performance. In the early stages it looked to be going Argyle’s way but eventually Alphington started to stamp their authority on the game. The hosts took the lead when Sophie Simpson was afforded too much room inside the penalty area and she fired an unstoppable shot into the roof of the net. The game moved from end to end but neither team really threatened a goal. Alphington tried a few shots from distance while at the other end Gabi Alphous had an effort that drifted wide, while Maya Ridge had an effort narrowly clearing the crossbar. However, Argyle eventually got the goal they needed ten minutes before half-time when an Alphous cross was handled by a defender inside the penalty area and up stepped Alex Hugh to confidently convert from the penalty spot. Argyle continued to struggle in the second half and they had to be grateful to Darnley for keeping them in the game. Three times the Argyle keeper came to their rescue. Jodie Randall then came to the Greens’ rescue with a fine goal-line clearance. Argyle were given a great opportunity when Alphington’s Laura Burwood was red carded, but they could not take advantage of the extra player. Manager Rob Bonney said: “We just didn’t get going and we struggled to find any rhythm all game. Argyle Development Squad: Amy Darnley, Rachel Javan, Vicki Fannon (Charlie Rollerson), Becky Parkyn, (Hannah Brock), Jodie Randall, Kelly Vinnicombe (Kiara Robins), Alex Hugh, Maya Ridge, Nicola Champion (Sally Salter), Gabi Alphous, Tamsin Medd-Gill. Substitute Unused Morgan Friend.